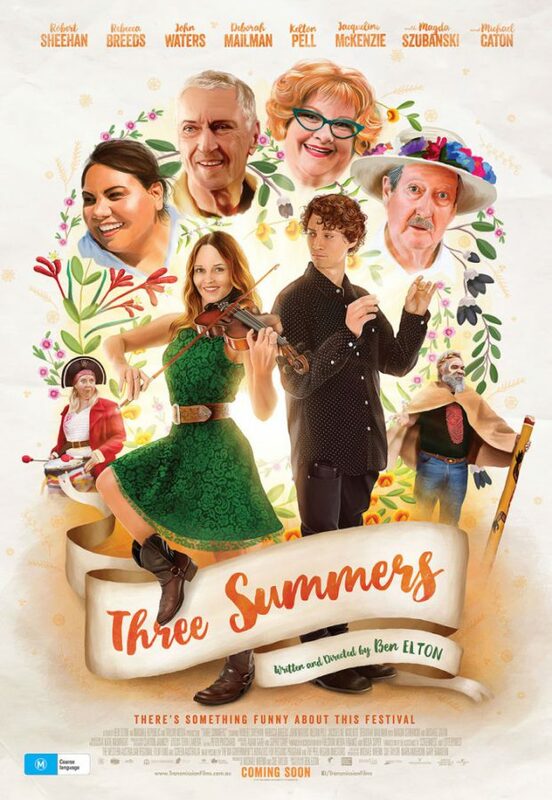 People from different walks of life have their world view challenged when attending an Australian folk music festival over the course of 3 consecutive years in Ben Elton’s Three Summers. Normally I don’t bring in context when reviewing a film but in some cases it’s unavoidable and really important in terms of understanding why the film exists in the first place. Ben Elton gave an introduction to this before a public screening at the Edinburgh International Film Festival and outlined what inspired him to make this film. Elton is an outsider to Australian culture having married an Australian woman and gaining a perspective on what the social structure of the country is life after experiencing it from the point of view of an outsider. The observations he made are grafted onto the characters in this film and the whole setup is designed as something of a commentary on how he sees Australia. I personally found that him talking about what he had personally experienced enhanced the film somewhat as I was able to understand some of the choices made though I fully acknowledge that the film should stand on its own and not require Ben Elton to introduce it in order for it to make sense. For the most part it does stand on its own and work as an ensemble comedy piece. There are a variety of characters who all feel distinct and carry different running gags really well. Some of them are funnier than others and there are certain aspects of the film that feel repetitive but that’s often the case in comedies. Thankfully these are few and far between so if something isn’t working for you then the perspective will shift to someone else before irritation really sets in. Three Summers works so well because of the comedic variety and makes good use of the characters to deliver some well placed jokes and physical comedy. Structuring the narrative around the characters returning to the festival over the course of three years works really well as it neatly divides the film into different acts and allows the character arcs to progress naturally through each festival. Some suspension of disbelief is required to ignore the fact that at least some of them would change significantly in the space of a year but it holds the film together slightly. In some cases the changes in some characters forms the foundation of a joke but on the whole the characters only develop when they are at the festival. Of course some characters will stand out more than others. Much of the film focuses on an unlikely romance between pretentious Theremin player Roland (Robert Sheehan) and talented singer/violinist Keevey (Rebecca Breeds). Roland is very much about maximising potential and using life to pursue only what makes someone happy where Keevey is burdened by a sense of responsibility to her father Eamon (John Waters) and their travelling folk band. Roland sees immense talent with Keevey and thinks that she is slumming it touring the country with this band when she could be doing so much more but Keevey has resigned herself to this lifestyle and feels fortunate that she is able to play music and make a living out of it. They make for a fun pairing because they challenge one another in both the right and wrong ways. Roland’s influence encourages Keevey to consider her potential and aim higher than she has before even if she resists the notion initially. Keevey calls Roland out on his pretentious attitude and makes it clear that the way he conducts himself isn’t always acceptable. Part of what makes their interactions so watchable is the volatility mixed with the genuine affection they clearly have for one another. There’s a great scene fairly early on where they make music together using the Theremin and the Violin in a way that shows their shared attraction in a really fun way. As the film progresses they have their ups and downs and it all comes across as both real and compelling. Unfortunately it builds to a saccharine conclusion that strains credibility but it almost works because of the work done up until that point. The actors should be commended for making this connection work. Roland could have easily been an insufferable character because of the way he expresses himself but Robert Sheehan has more than enough innate charm to make this work. There’s a lot beneath the surface to suggest that Roland is fundamentally a good person even if he doesn’t express it in a way that people accept. Rebecca Breeds is bubbly and charismatic which helps establish Keevey as someone people want to be around. She approaches everything with infectious positivity but speaks her mind and stands up for herself throughout with the confidence to back up her convictions. She is not someone to be messed with or taken advantage of and Rebecca Breeds delivers this wonderfully. Other characters have distinct arcs to follow that conclude at the end of the film. Henry (Michael Caton) starts off the film with a particular opinion of what being an Australian citizen means and continually has that world view challenged over the course of the film. It’s a very predictable arc but handled earnestly though the light touch approach feels too light at some points. There’s a lot of comedy to be mined from this character from his interactions with his Morris Dancer troupe to constantly being proven wrong about his outdated opinions. There are other smaller developments with different members of the ensemble but Henry goes through the most significant change. In terms of comedy there are some standouts such as Magda’s Szubanski’s Queenie; a radio host delivering coverage of the festival. The way she handles difficult interviews, situations that may not be of interest to large numbers of people and the general festival atmosphere never fail to entertain and her consistent presence is important in terms of holding the film and the characters together. Another comedic standout is security guard Linda (Kate Box) who is hilariously obsessed with regulations. She is deployed just enough to be an effective running gag without ever become obnoxious or tiresome. Once again she represents consistency which adds legitimacy to the fictional festival. One thing this film doesn’t handle quite so well is tone. It is broadly a comedy and sticks to that for the most part but it also attempts to tackle some really heavy racial and social issues that just don’t work when considered with such a light touch. There are certain realities to immigrant life in Australia that are touched on but not explored in great detail. When these come up it feels like there is an imbalance between what the film is trying to say about these issues as well as people’s attitude to them and the attempt to keep the audience entertained through making them laugh. I’m not saying that these issues shouldn’t be part of the film and it’s clear that Ben Elton’s perspective of them borders on unique but he doesn’t quite find a way to integrate them organically into the overall narrative. It’s one of those scenarios where I appreciated the attempt but wasn’t keen on the execution. A charming film with engaging characters, plenty of laughs and a fun setup. The central Roland/Keevey relationship carries the film nicely as they are both well written and performed characters who are a joy to watch both together and apart. Many of the side characters manage to be memorable in their own way though the film does suffer from an imbalance in tone when trying to broach more serious issues. It was a good idea though the execution left a lot to be desired.